Despite two months of heathcare.gov being completely broken a lot of procrastinating, 1.1 million people managed to enroll in private insurance via the federal website, the Centers for Medicare and Medicaid announced on Sunday. About 975,000 of those sign-ups happened in December. 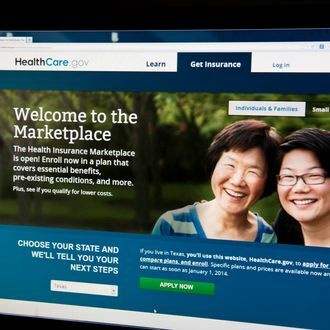 That’s a significant improvement over October and November, when a mere combined 137,000 bought plans. Meanwhile, an estimated 850,000 Americans have gotten healthcare through state marketplaces, bringing the total number of Obamacare enrollees to over 2 million. Of course, that falls significantly short of the 3.3 million sign-ups the Obama administration had hoped to see by the end of December. The White House’s goal is to get 7 million people under Obamacare in 2014, which means there’s still a lot of work — and fun ad campaigns — to do.